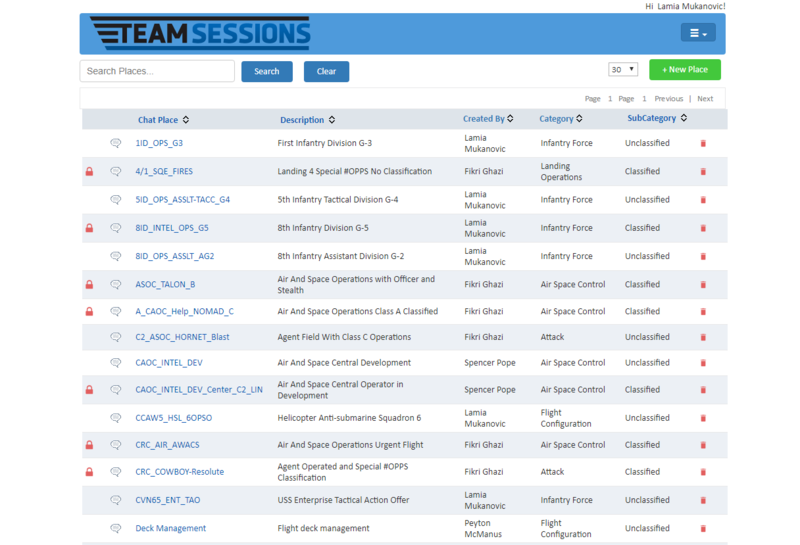 Designed for today's connected warrior, Team Sessions provides a platform for secure, connected, global tactical chat rooms. 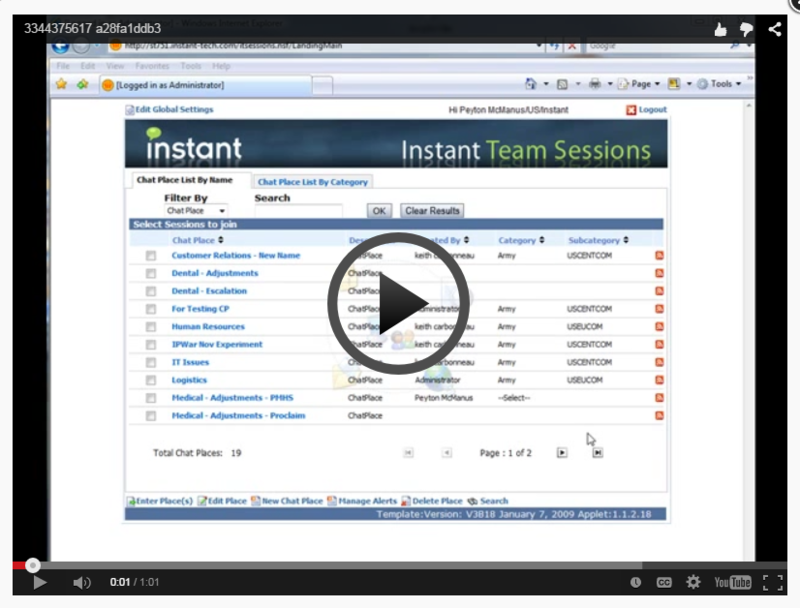 Instant Team Sessions allows teams to instantly share ideas, documents, and information. 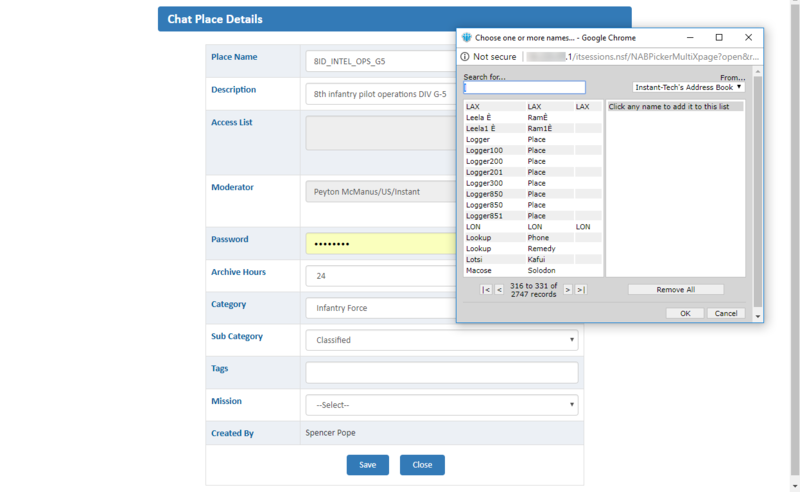 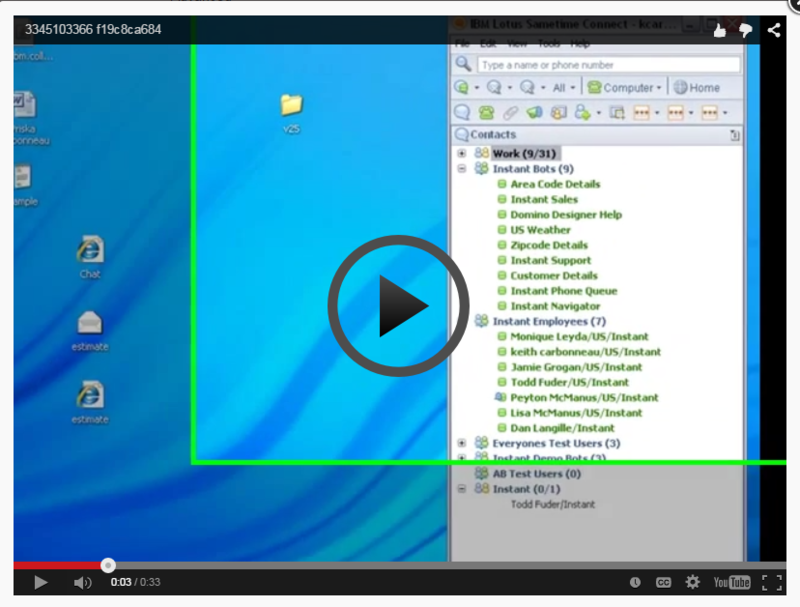 Quickly build Lotus Sametime® based persistent virtual chat rooms to facilitate real-time collaboration. 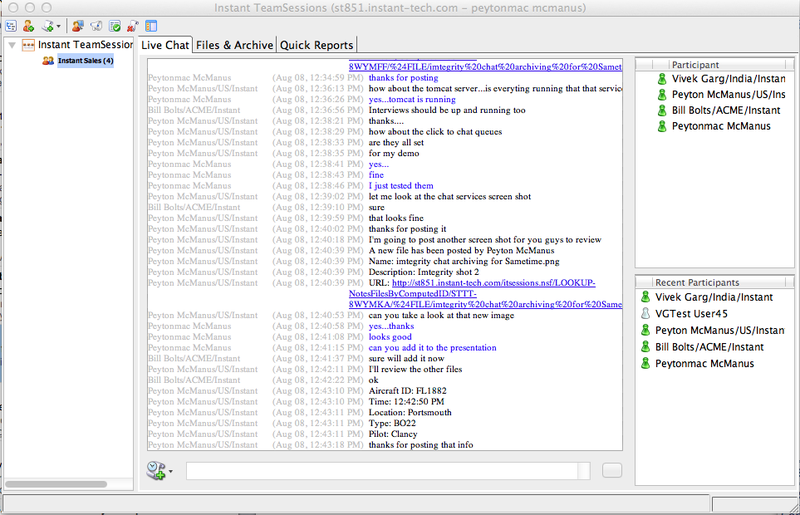 Tactical chat rooms are secure and discussions are encrypted. 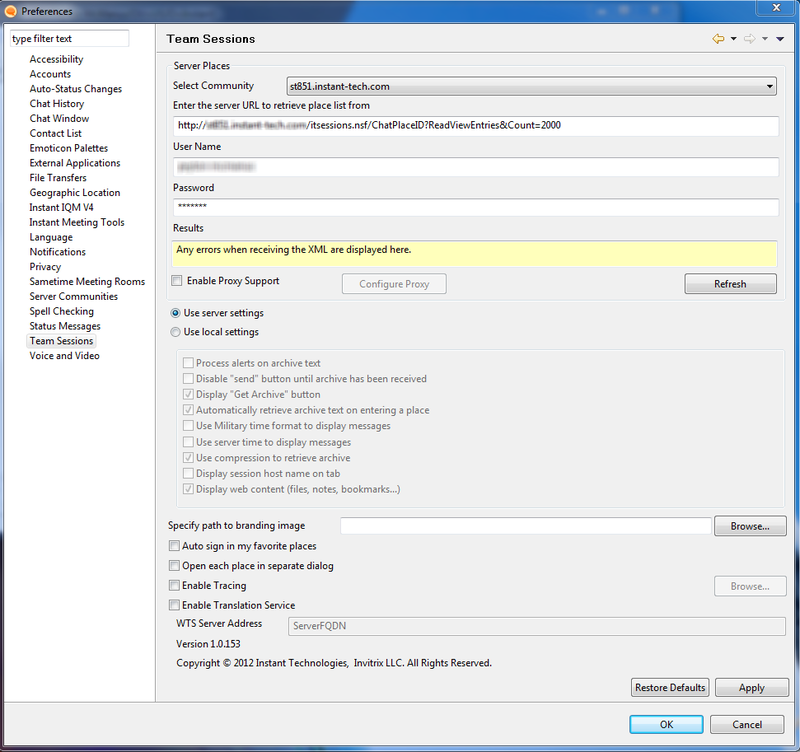 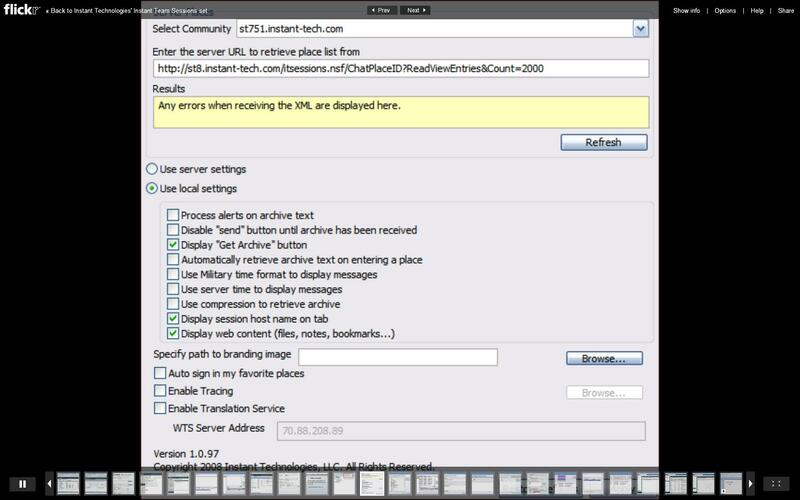 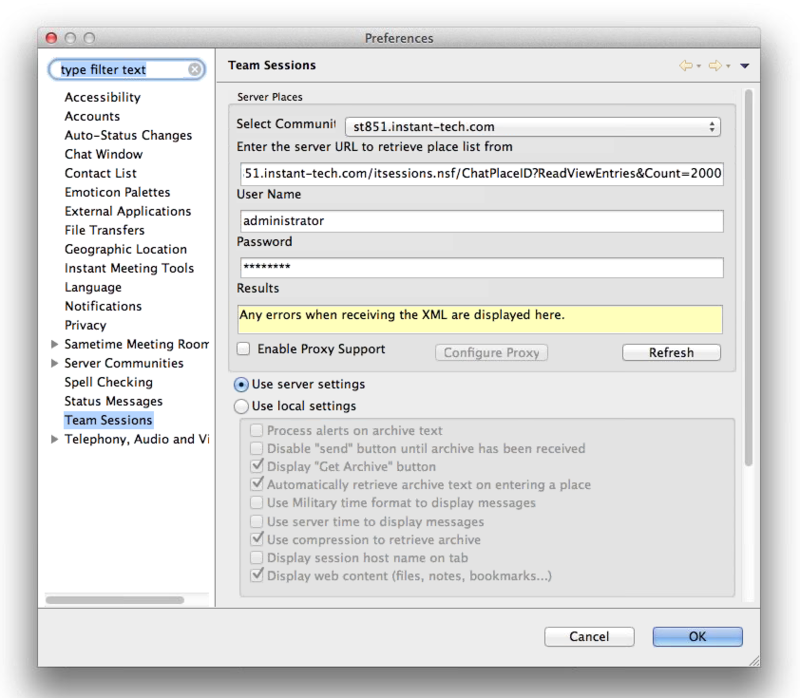 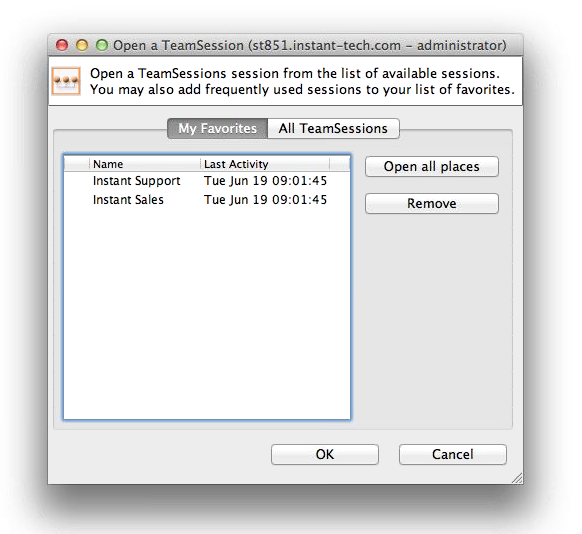 The Team Sessions server automatically records discussions and manages content such as images, documents, or spreadsheets. 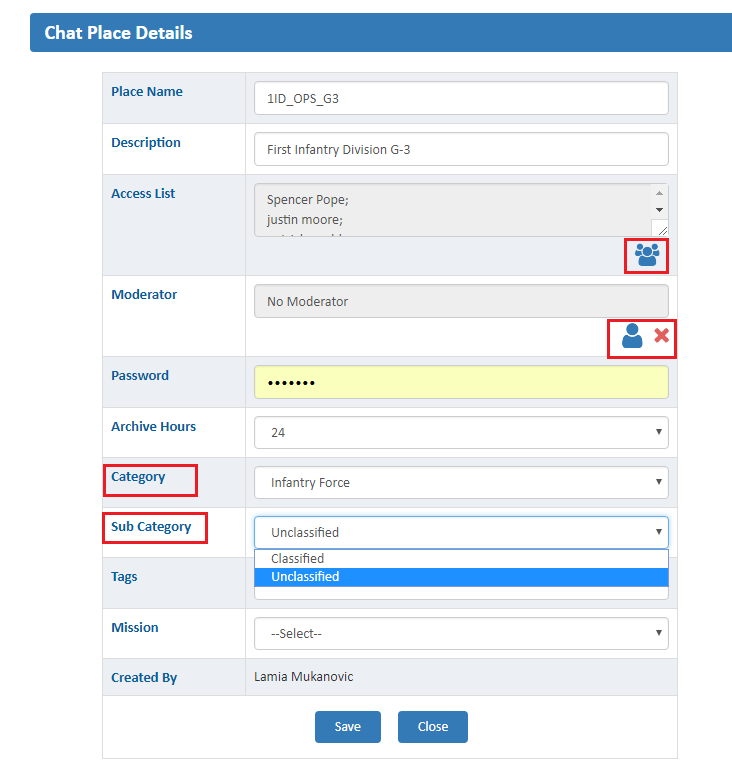 When new participants enter the Sametime® persistent tactical chat room (Team Sessions), they are instantly provided with a history of the discussion. 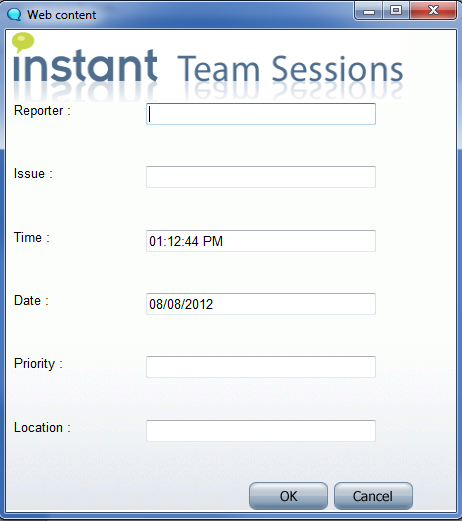 With Instant Team Sessions for IBM Lotus Sametime®, your teams can securely share information in real-time, thereby improving communication and enhancing team performance. 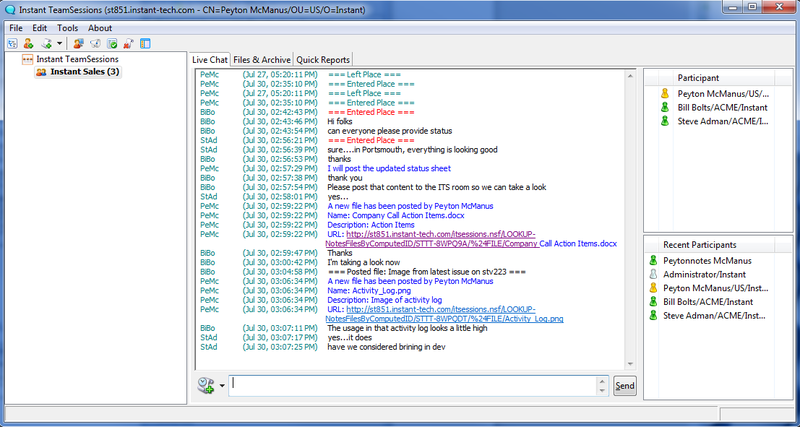 Persistent Tactical Chat Rooms: Members can come and go at will; the room - and a transcript of all that transpired - will be there when they return. 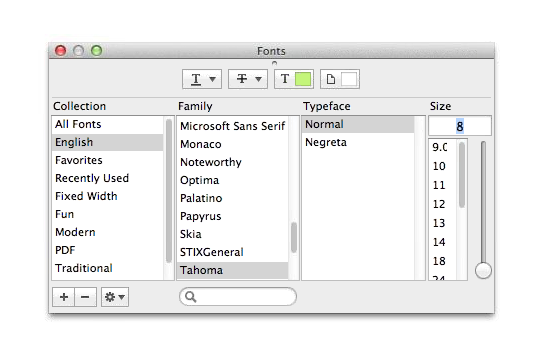 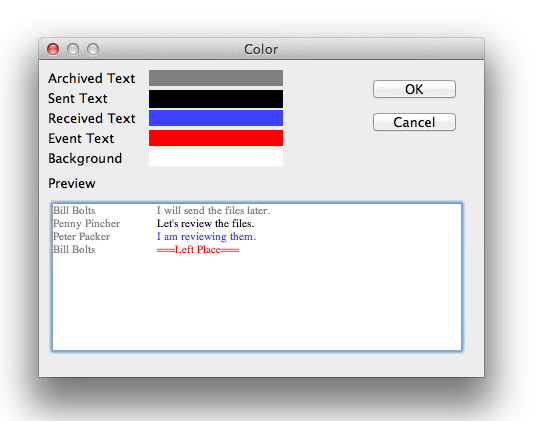 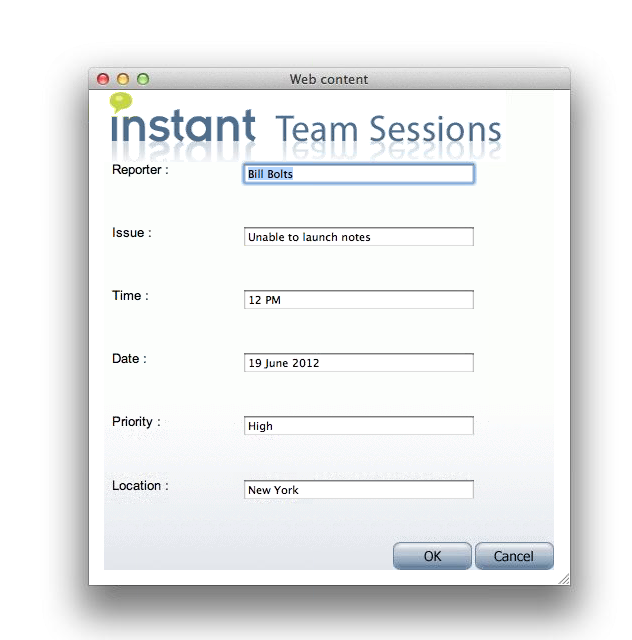 Persistent Content: Store information relevant to the team such as discussions, task lists, documents, and bookmarks. 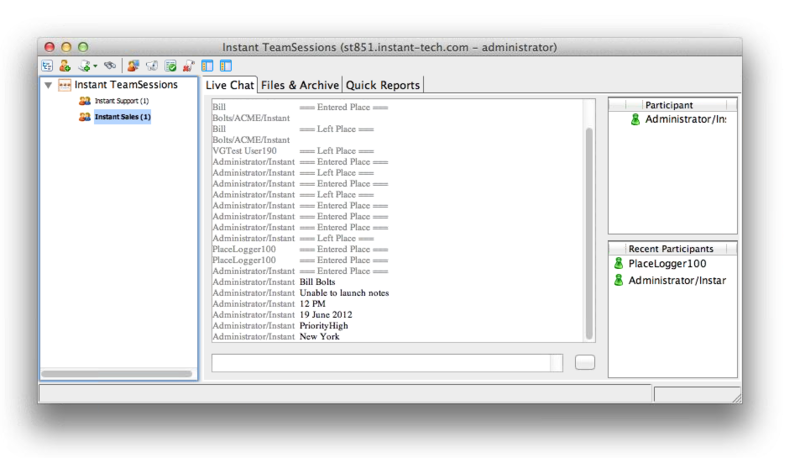 Secure Real-time Tactical Chat Rooms; Encrypted Discussions: Discuss confidential matters and share sensitive documents safely. 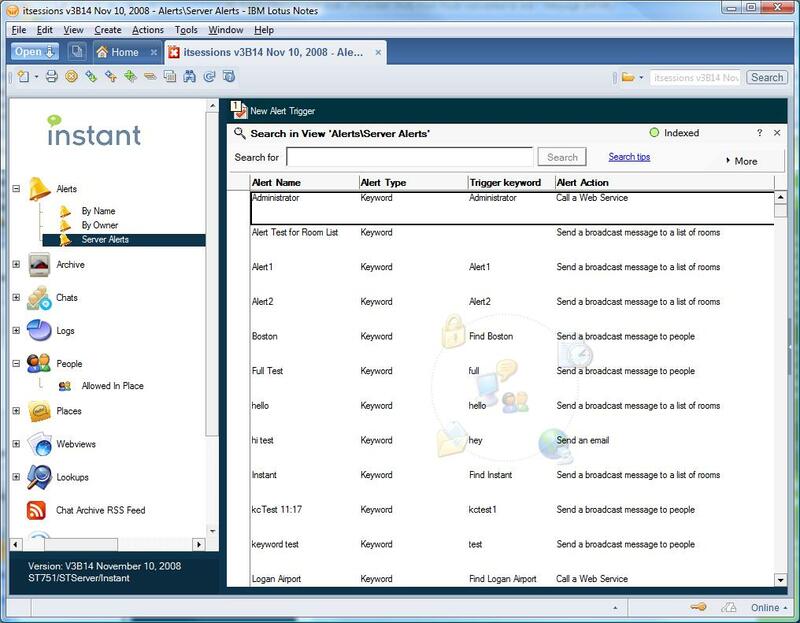 Users are authenticated based on personal login information, and each room may have a unique access control list. 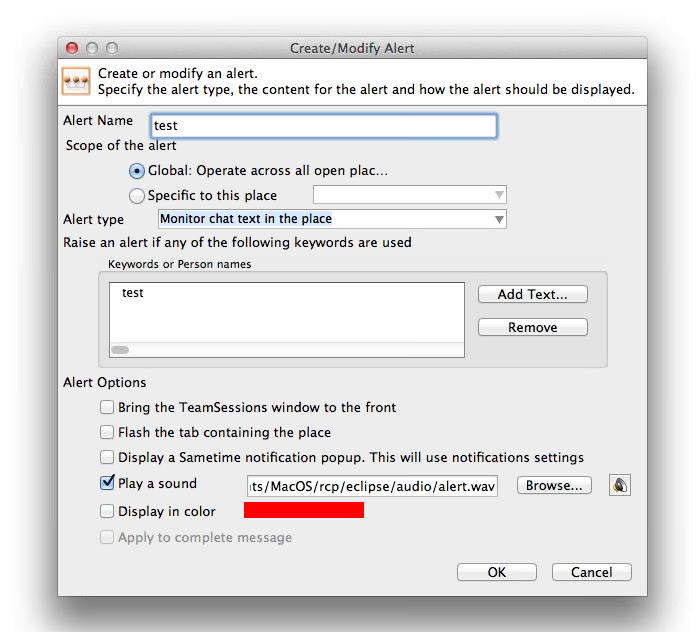 Automatic Contextual Alerts: Users can create alerts so they will be notified when a topic relevant to their requirements is being discussed. 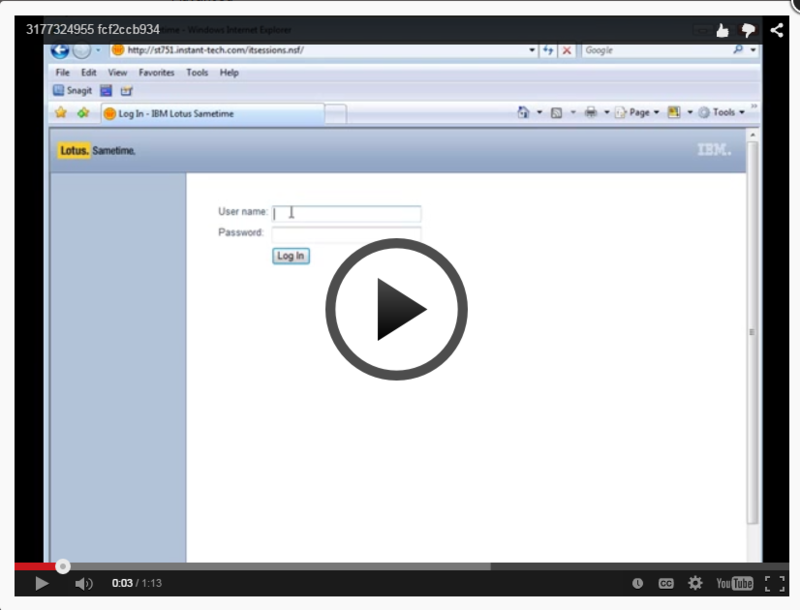 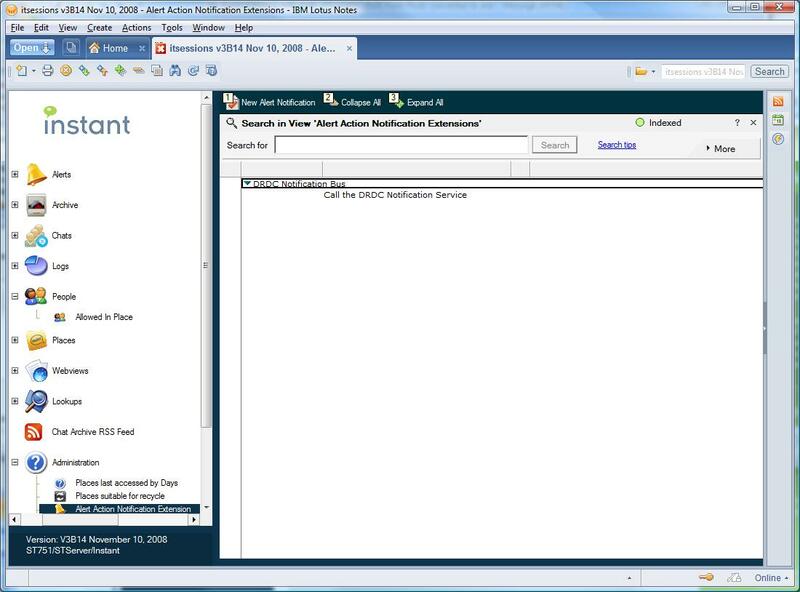 Runs On Domino: Built on standard Lotus Domino and Lotus Sametime® systems - you do not need to license, install, and manage Websphere®. 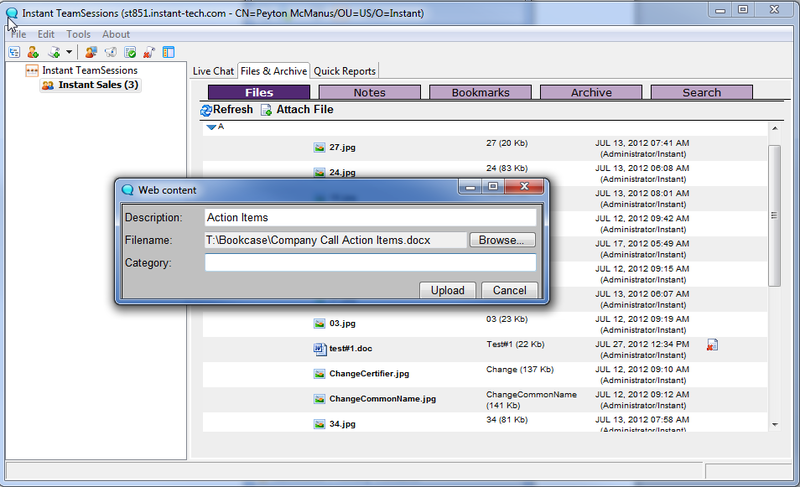 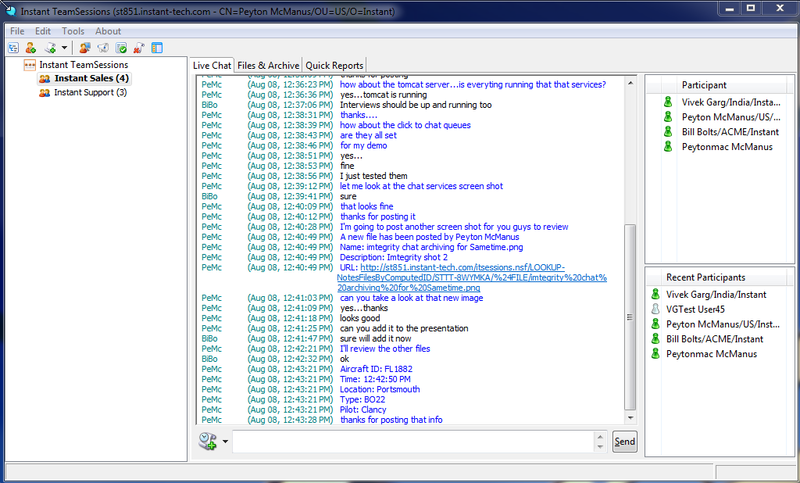 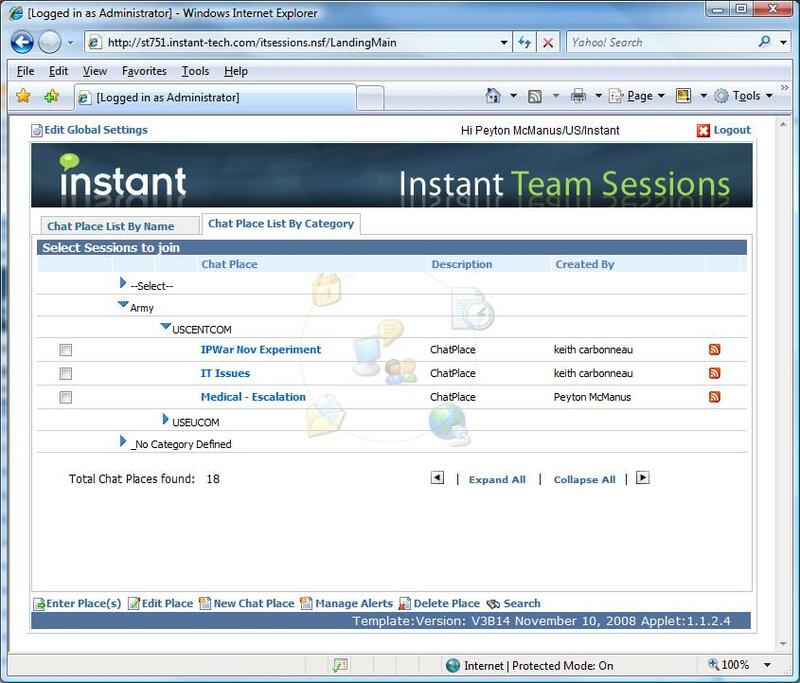 Leverages IBM Instant Messaging/Sametime®: Works with Sametime® 3.0 and later - including Sametime® 7.5x and 9.x. 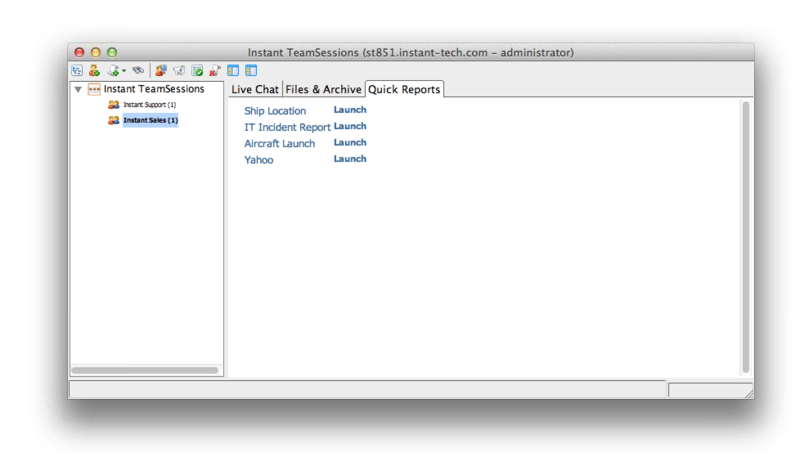 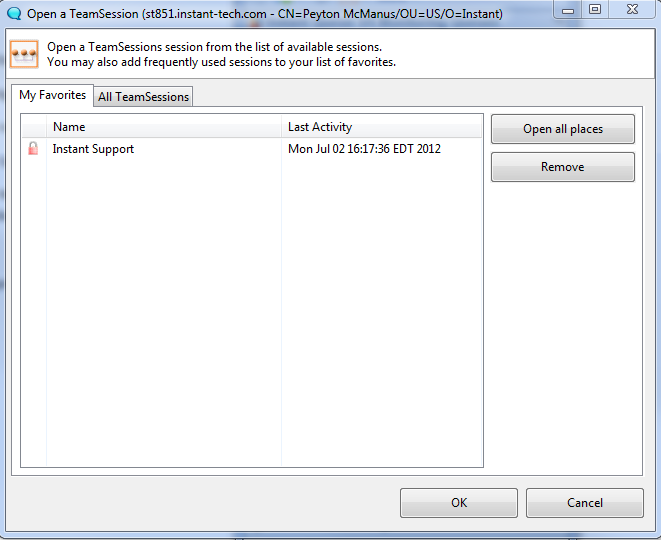 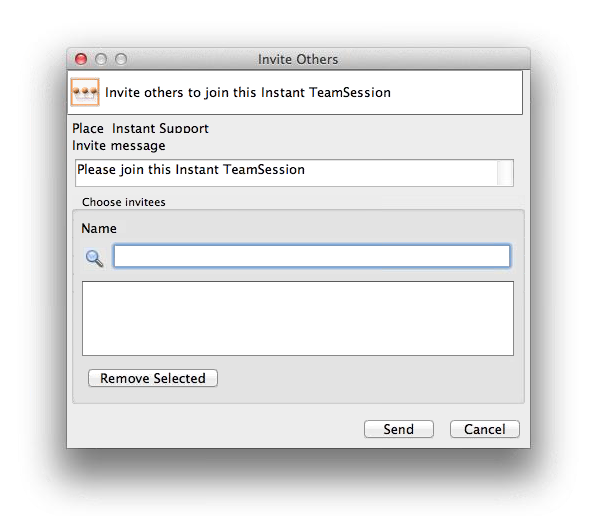 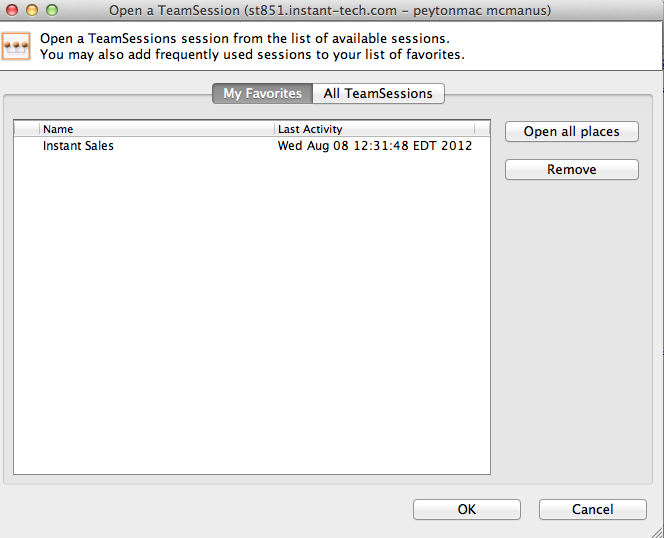 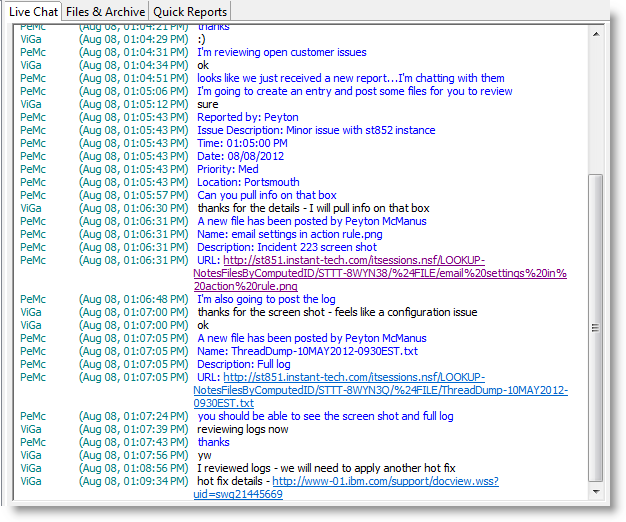 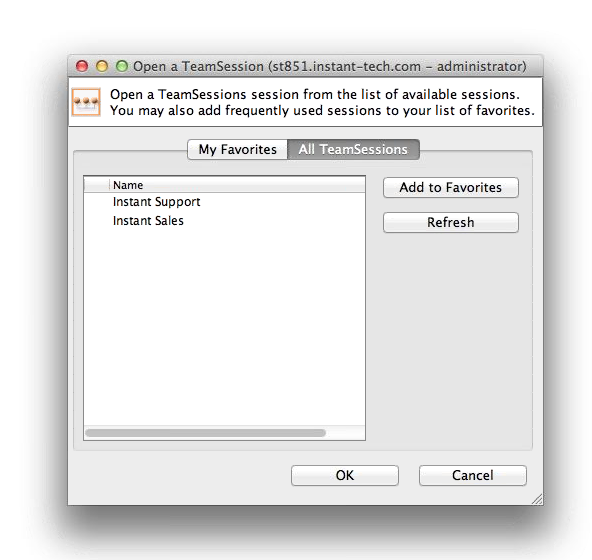 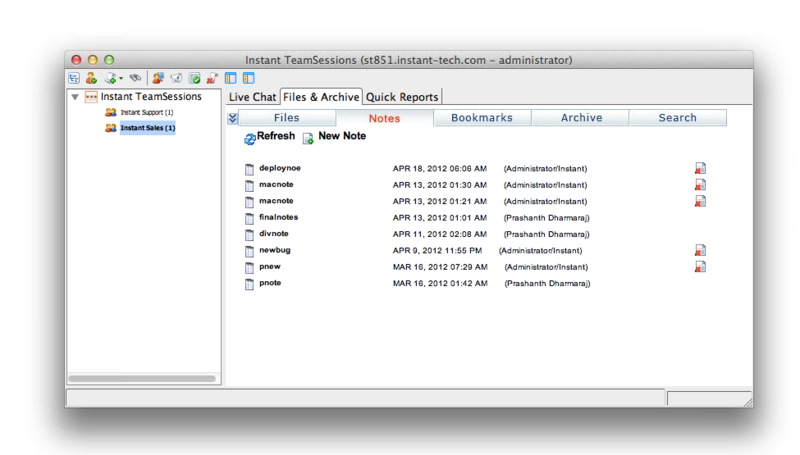 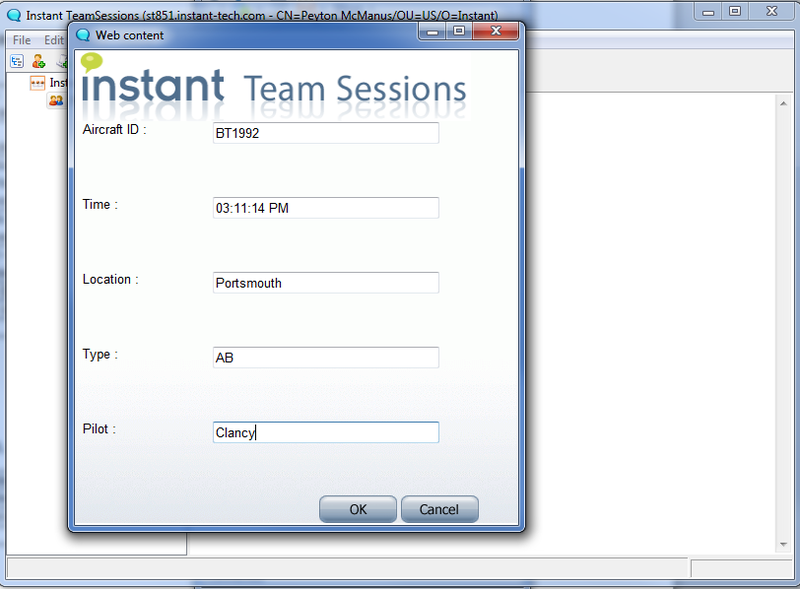 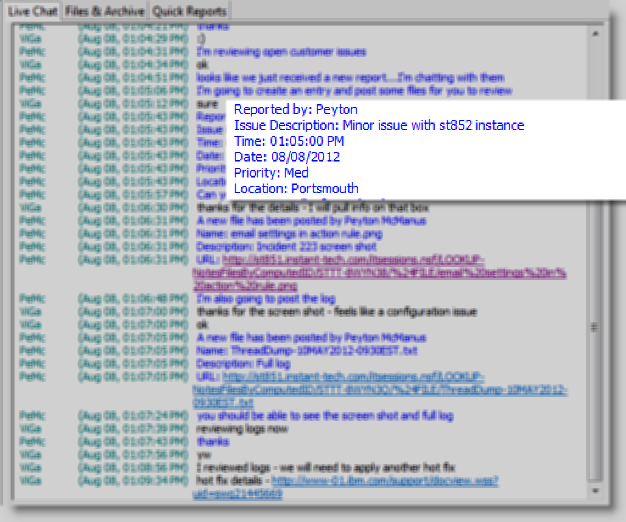 Instant Team Sessions Version 3 further extends Instant Team Sessions' lead over all other persistent chat solutions. 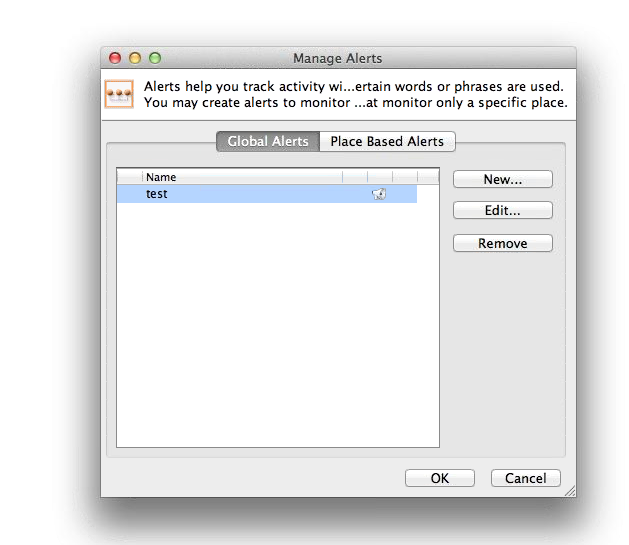 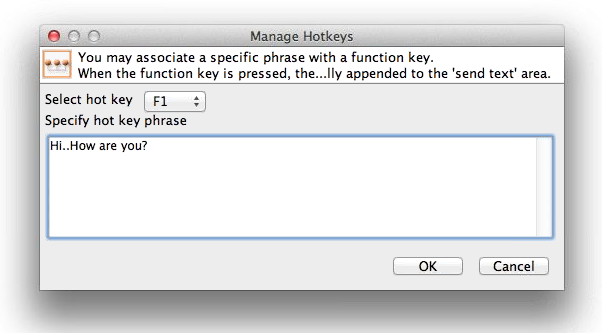 As described on the "What's New?" 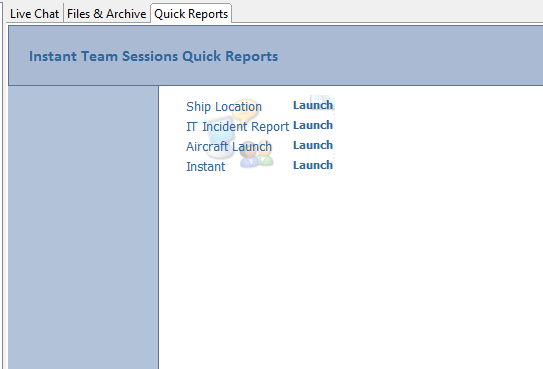 page, Instant Team Sessions V3 adds a wealth of new features and functions developed in response to real-world feedback from some of the world's largest government and commercial organizations. 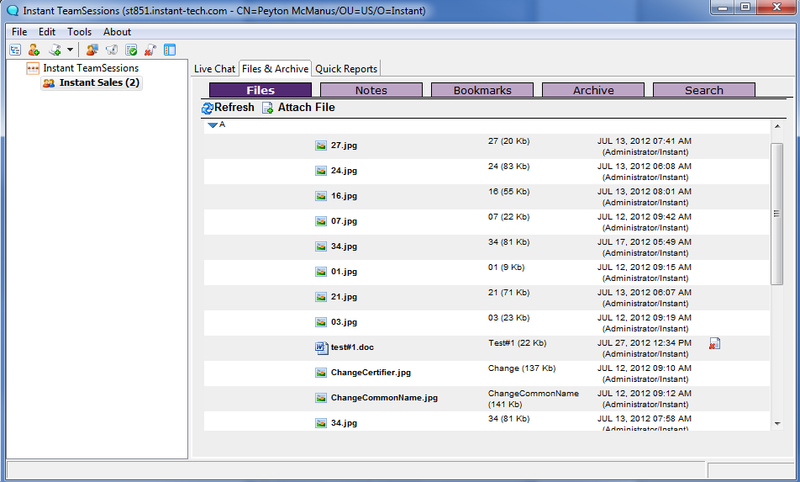 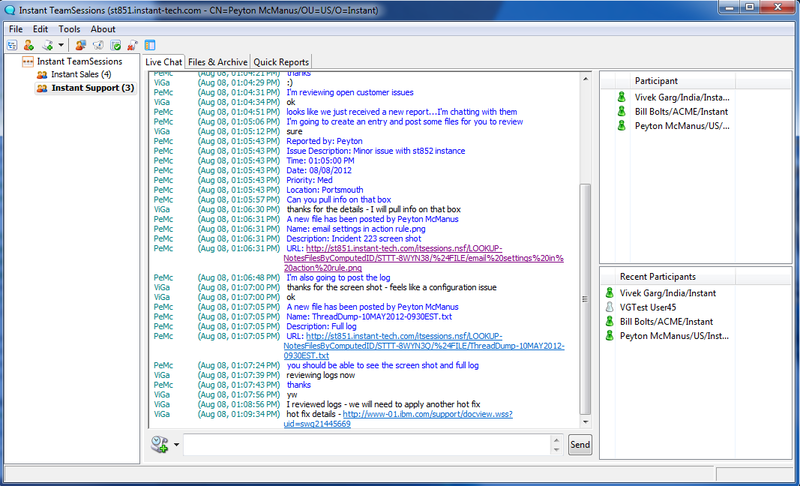 V3's new features include an updated user interface, server based alerts, the ability to restore persistent tactical chat rooms and their content (files, bookmarks, etc), the ability to subscribe to RSS feeds of persistent chat archives, enhanced persistent tactical chat room search capabilities and much more. 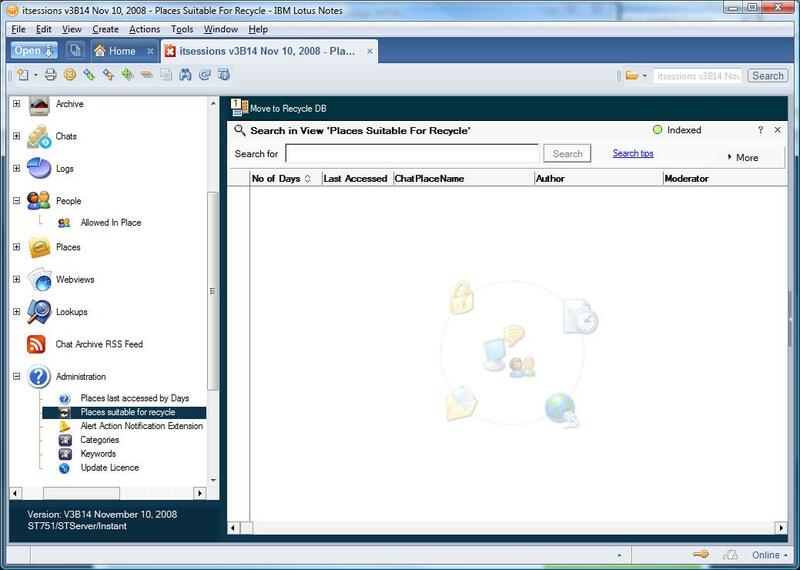 When the US Department of Defense asked IBM for secure, encrypted persistent chat in Lotus Sametime®, IBM turned to Instant Technologies and Instant Team Sessions. 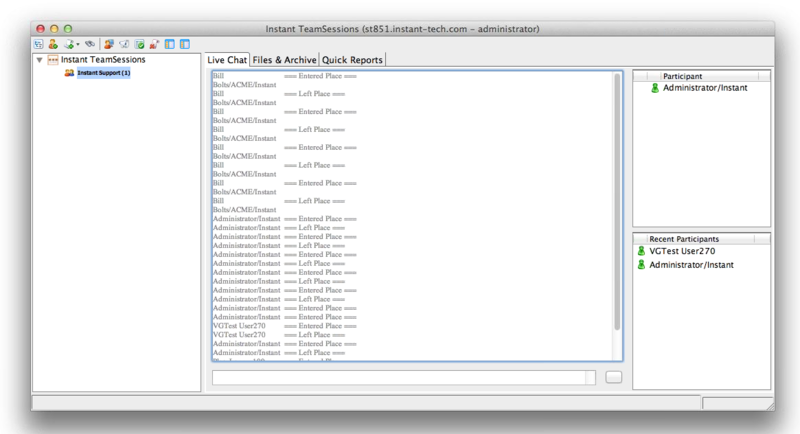 Read the case study for details. 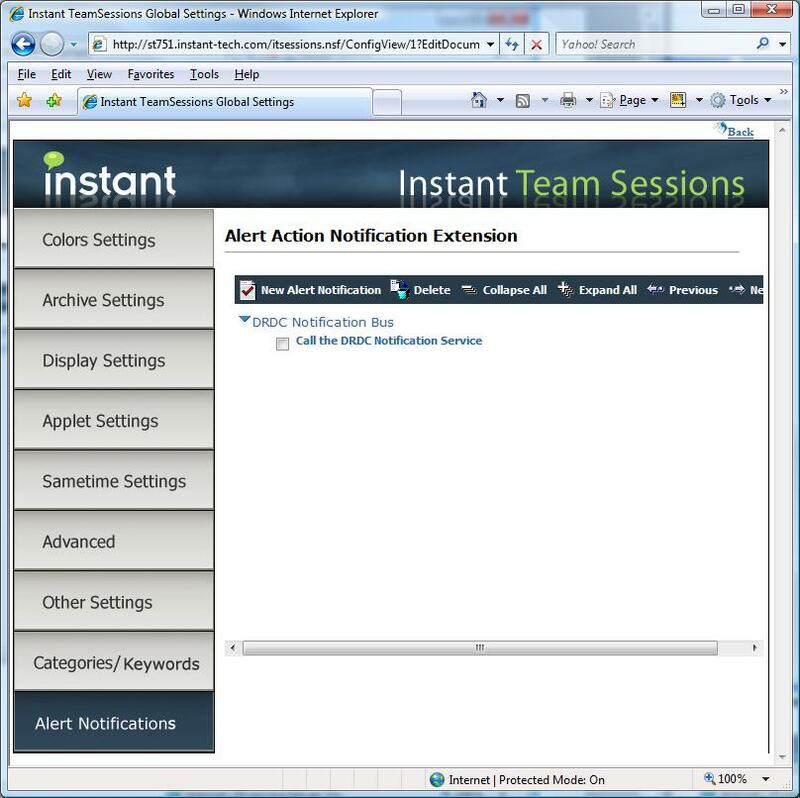 Instant Team Sessions is the secure, real time collaboration platform for many of the largest and most advanced defense organizations in the world. 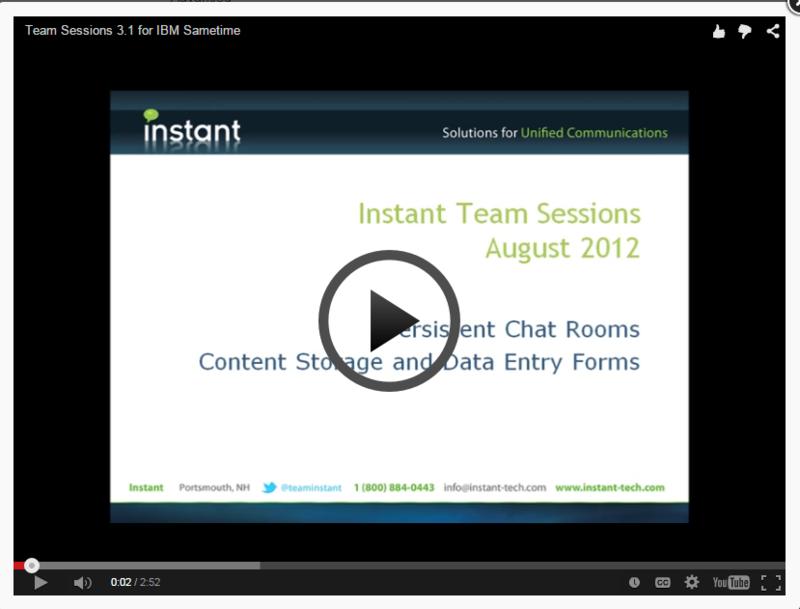 Learn how the power of persistent tactical chat can improve your cross-organizational collaboration. 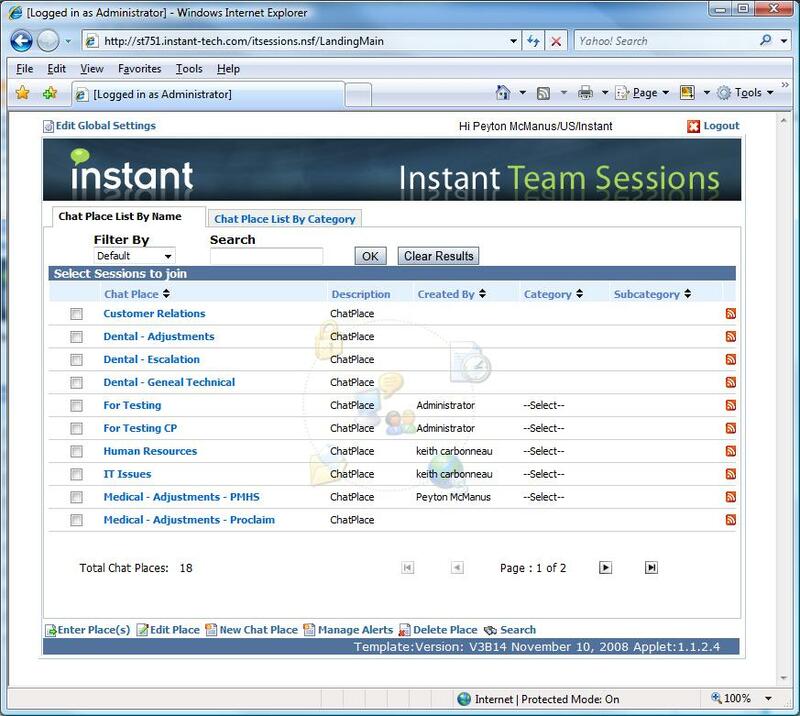 This solution brief includes real-world examples describing how IBM is deploying Instant's solutions to their enterprise, military, and government customers and describes the benefits of deploying persistent chat in the enterprise.